Abit stunned the world when they announced the unique GeForce4 Ti4200 OTES (Outside Thermal Exhaust System) cooling system; they said it would keep the GeForce4 Ti4200 GPU substantially cooler then all the other GF4 coolers out there. Though, it would have been nice to see Abit go all the way and include some form of memory cooling as well, since the Samsung 3.6ns TSOP-II memory runs hotter than BGA DRAM. 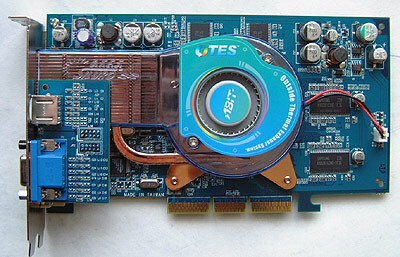 The Abit GF4 Ti4200-8x OTES is a very big, and heavy videocard. It is also the only card in this roundup that takes up not just the AGP slot, but also the first PCI slot as well. The OTES cooler uses a heat pipe to draw heat away from the GPU to a small field of soldered on copper fins. When working as designed, the OTES cooler should enjoy the larger cooling surface area over that of the stock heatsink. An integrated squirrel cage fan blows air from inside the case, over the copper fins, and then out of the entire case via the PCI slot. It all looks mighty impressive, and nVidia have even demo'd the next generation GeForceFX with a variation on ABIT's OTES. Generally speaking, our fancy video cards can never really run cool enough, and this can't be more true then when it comes to overclocking. We had some pretty high expectations for the ABit card in terms of overclocking, and with the core already clocked at 275 MHz (25 MHz above stock speeds) we began to increase the speed. The GeForce Ti4200 GPU reached 290MHz, 295MHz and 300MHz without any problems. At a core speed of 305 MHz however, the Abit card would lock up while running the nature demo in 3DMark2001SE which usually means too high a core speed. After we lowered the core speed to 304 MHz, the Abit Ti4200 OTES could pass every test we threw at it. The memory on this card is by default is clocked at 500 MHz so we were gentle when it came to overclocking. Anything speeds higher then 599 MHz and the Artifact Tester would start registering artifacts. They were not visible, but once the program found some, we stopped overclocking the memory and hung our hats up. 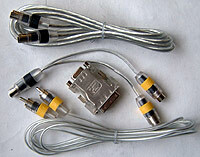 It's not surprising that the memory was only able to reach 599MHz, most Ti4200's do not tend to get much past 600 MHz. Our expectations for a core overclock were a little higher than the 305MHz we were able to eek out of the Abit OTES, especially with such an elaborate GPU cooler. I guess that just goes to show you overclocking videocards sometimes just comes down to the pick of the litter.